The main element of the composition is the old wooden bridge in Battersea, destroyed in 1881. This bridge was considered quite a dangerous place, because many times it was damaged by the ships, which squeezed effortlessly between its closely packed piles. Wanting to give the bridge a more elegant appearance, Whistler changed its outlines, increasing the height of the structure and expanding its spans. Most likely, this picture was created under the influence of engravings by the Japanese artist Hirosige with the image of fireworks. It is interesting to note that “Nocturne in blue and gold” is written as if the author was sitting in a boat. “Thoughtful” atmosphere Whistler conveyed with the help of free, wide strokes, thanks to which the far bank of the river seems enveloped in misty haze. 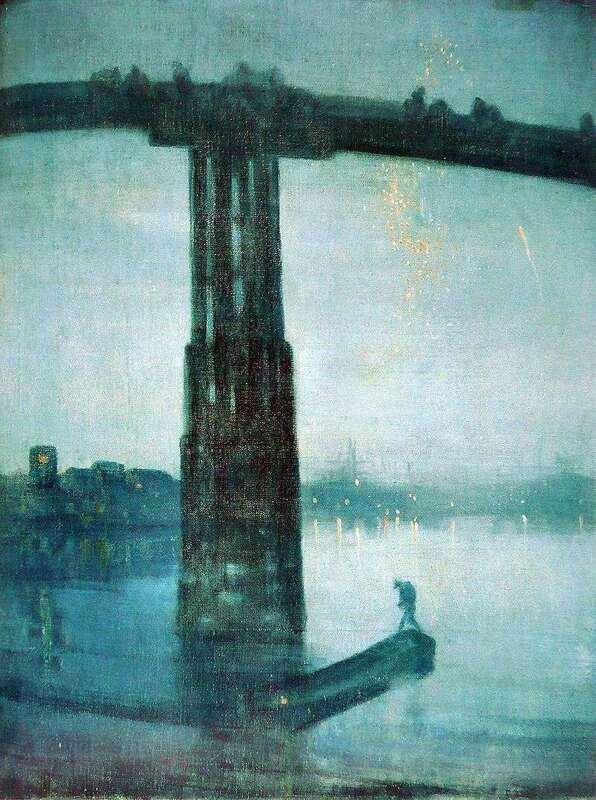 Description and meaning of the painting Nocturne in blue and gold: Old Bridge in Battersea by James Whistler.